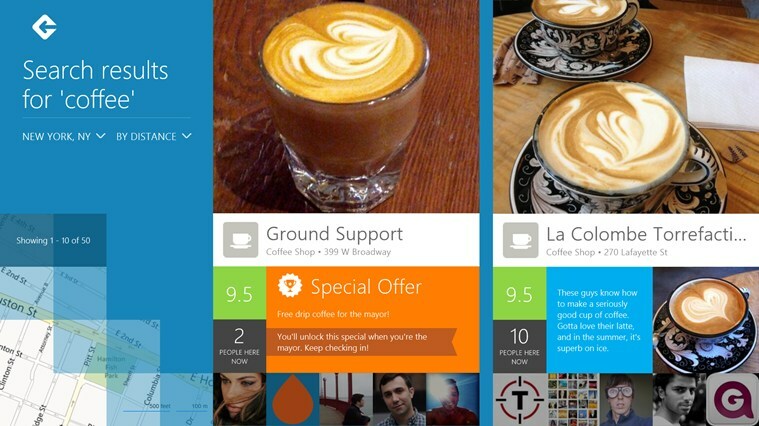 Foursquare for Windows 8 is here, and it is looking awesome. This is the first true Foursquare tablet application, and we have to admit, the design fits well with Windows 8’s Metro theme. Yes, the Foursquare app is available for other tablet platforms, but unlike the Windows 8 version, they were not built from the ground up for tablets specifically. The first time we saw Foursquare for Windows 8 was back in June at the Microsoft BUILD conference. It looked great back then, but seeing what it looks like in person is a completely different story. The design is top notch, and performance in our testing is just as good. The moment you log in, the app will place the best venues at your location close for you to see, furthermore; there’s a neat little map with notable venues marked when you scroll or swipe to the left. In addition, the Foursquare app integrates well with the Charms menu in Windows 8. Begin typing and it will locate whatever it is that you’re looking for. We like how search results scroll horizontally with each venue highlighting user rating and if there’s a special offer on hand. It’s really helpful and should make things less time consuming when searching for the best spot to have a beer. While the app is a step up from the versions on mobile and other tablet platforms, we didn’t enjoy not having the ability to interact with the map. We hope the developers take a look into this and make it happen in a future update.